Home › SILENCER › What is Silencer? 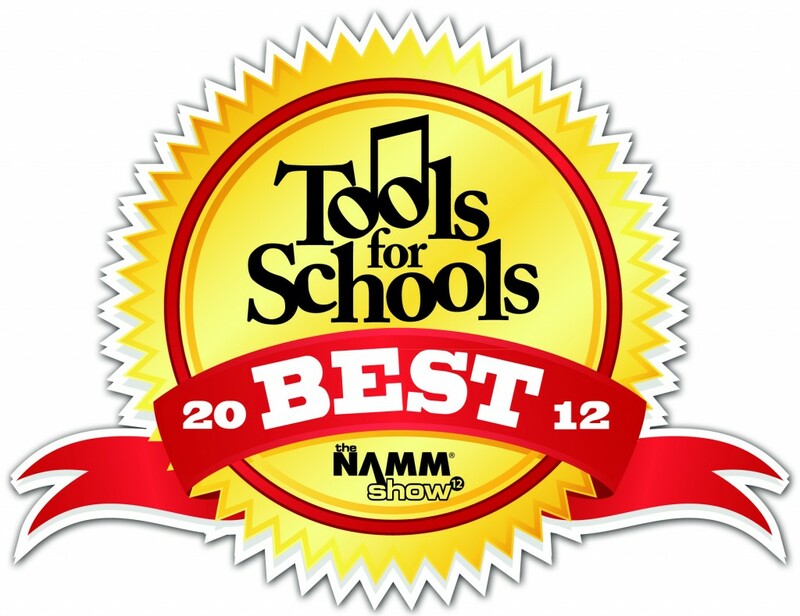 Silencer is National Association of Music Merchants NAMM-2012 in USA award winner in the category Best Tools for Schools, selected by Panel of music educators. A lot of people are often surprised when they realize that you can produce tones and whole melodies with the mouthpiece of a saxophone or a clarinet alone. What it sounds like depends solely on the person who is blowing into the mouthpiece because everything that comes out is only affected by the person who is blowing. These findings prompted Joe Allard, the grand master of the woodwinds, to develop a new method of training and suitable exercises, among which are the mouthpiece exercises. With these exercises Joe Allard documented astonishing results while having comparatively little expenditure of time. Among his students were saxophonists as David Liebman, Michael Brecker, Stan Getz, Bob Berg and Glenn Miller’s whole sax-section. Basically, one can take the mouthpiece to any place and exercise on it everywhere. For example; on the train, in a car, (only with a turned off motor of course) or in a hotel room. But practically there is one serious disadvantage: The tone produced by the mouthpiece is approximately 100 dB loud and therefore trouble with passengers or hotel guests, as well as neighbors, is already pre-programmed! Wilhelm Busch said: “Music is often found to be disturbing because it is connected to noise.” What is loud music for one person is noise for another. Whoever wants to hear music does not feel disturbed. Whoever likes turning up the volume does this without the feeling that it is noise. The ears are a sensitive organ and what is sensed as noise depends mainly on the ability to influence the sound. Moreover, it depends on the sound, whether it sounds more or less harmonic, whether it screeches, whistles, bangs, rumbles or hammers. In order not to disturb the neighbors one has to become quieter. Here the silencer produces relief! With a put-on mouthpiece-mute the volume is reduced significantly: It reduces the volume by 14 to 20 decibels! In other words: The volume heard by a human is 5 to 10 times quieter. The fact is, you hear the volume a multiple quieter with the silencer. 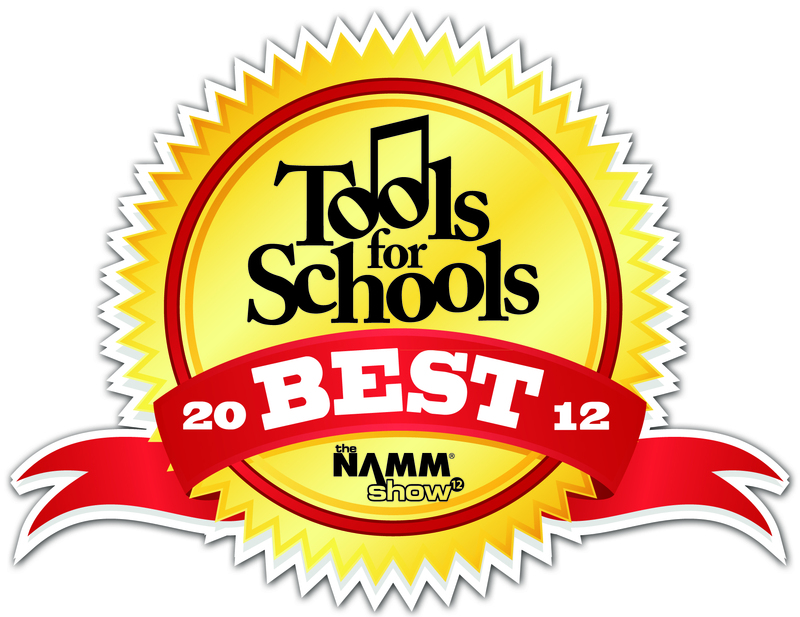 You can practice very quietly at any time – whether night or day – and at any place! The silencer for tenor saxophone for example goes with every brand of tenor saxophone mouthpieces. Unfortunately, each of these brands has its own bore. 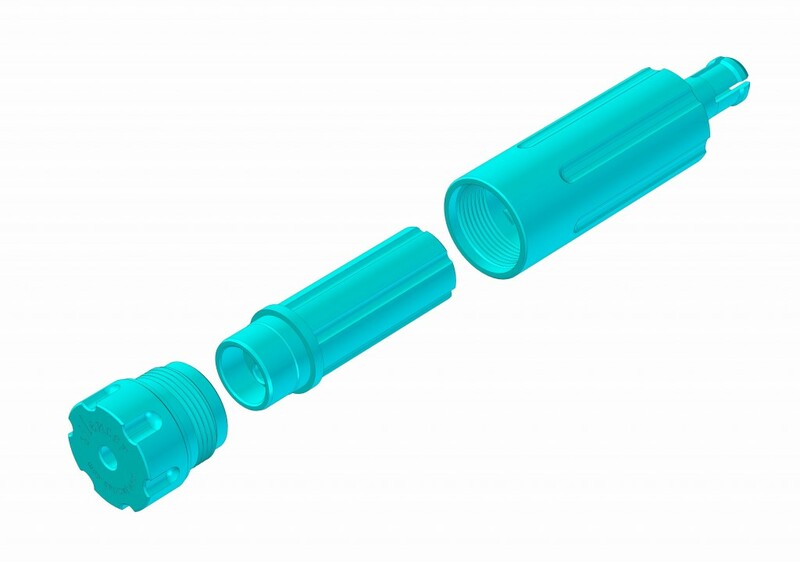 Therefore, the silencer’s coupling piece has four springy elements, which compensate for the differences among the bores and provide a tight fit at the mouthpiece. A cone at the root of the coupling piece creates the tightness. As for the clarinet, the mouthpiece-cork does the sealing while compensating, to a certain extent, for the differences in diameter. The silencer is the result of countless hours of research and development. You are now a proud owner of a perfect mouthpiece-mute. Patents for the silencer are pending worldwide. 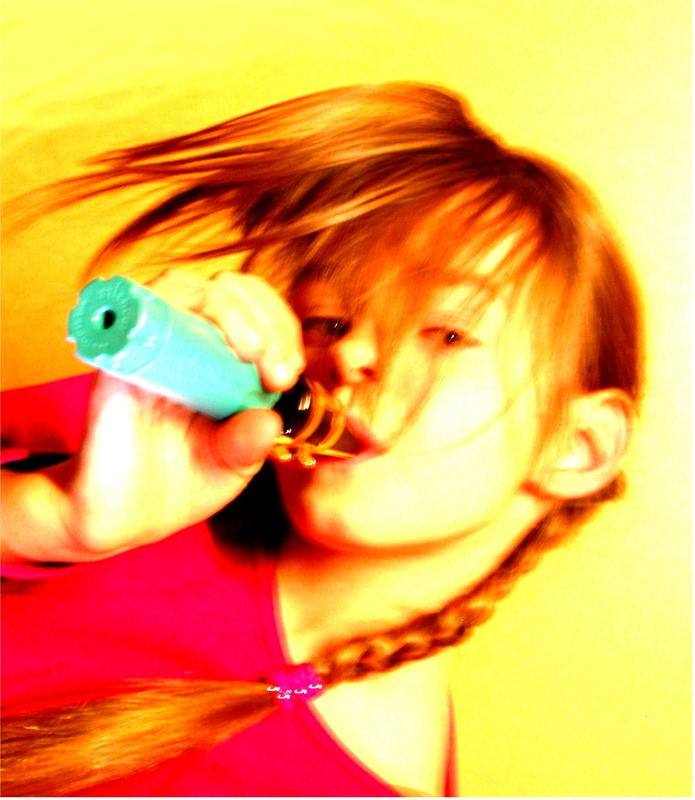 The silencer is made of high quality plastic, easy for handling and cleaning. It only works correctly if all three parts are assembled correctly and are cleaned after every usage. 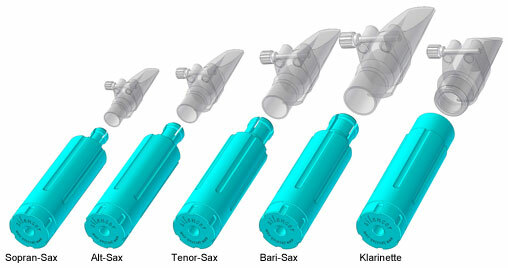 If you own multiple silencers for multiple instruments, please notice the fact that the coupling pieces are of different sizes. The cases are identified for the coupling pieces. (For example with “TENOR SAX” or “ALTO SAX”) Only the right insertion end fits into the cap. The silencer’s assembly is easy: Stick the muffler with a slightly rotating movement into the mouthpiece. As for a clarinet mouthpiece, you might need some cork-grease. After finishing the exercises you can pull the silencer – again slightly rotating – out of the mouthpiece. Now you can easily screw off the silencer-cap and separate it from the insertion. For hygienic reasons we recommend cleaning the silencer under water after each usage. Do not use caustic cleaning agents. On demand (to decalcify it) you can put the separate parts into a glass of vinegar for one hour and then wash it with water. After drying the parts stick the insertion into the cap and then screw the cap onto the case.